I cooked lettuce once. It was a Nigella Lawson recipe. We didn’t enjoy it, it was awful. To this day, I don’t know whether it was the recipe, the lettuce, or my execution that was at fault. All I know is that we didn’t (couldn’t) eat it – it went into the bin. For the avoidance of doubt, that was the only Nigella recipe I’ve ever had a problem with – I have cooked very many of her recipes, and all have been delicious. Except for the lettuce. The braised lettuce has been the only reject to date, and boy was it unpleasant. Petits Pois à la Française starts off with Little Gem lettuce being placed in a pan of melted butter, and then cooked with a bunch of other things (notably peas). So, of course I was worried. I love peas. Cooked lettuce, I’m much less sure about. The recipe is very straightforward – not really very much to describe. Melt butter in a pan, and add lettuce, freshly shelled peas, onions, a little sugar and salt, and then some water. Put the lid on firmly and let it steam away for half an hour or so. Uncover, keep cooking until the liquid has gone, and finish off by stirring in some more butter. Hopkinson and Bareham suggest eating it in a bowl on its own, accompanied by some triangles of fried bread. I confess, that felt a little inadequate for the main meal of the day. What if I didn’t like it that much? After all, it was stuffed full of cooked lettuce. 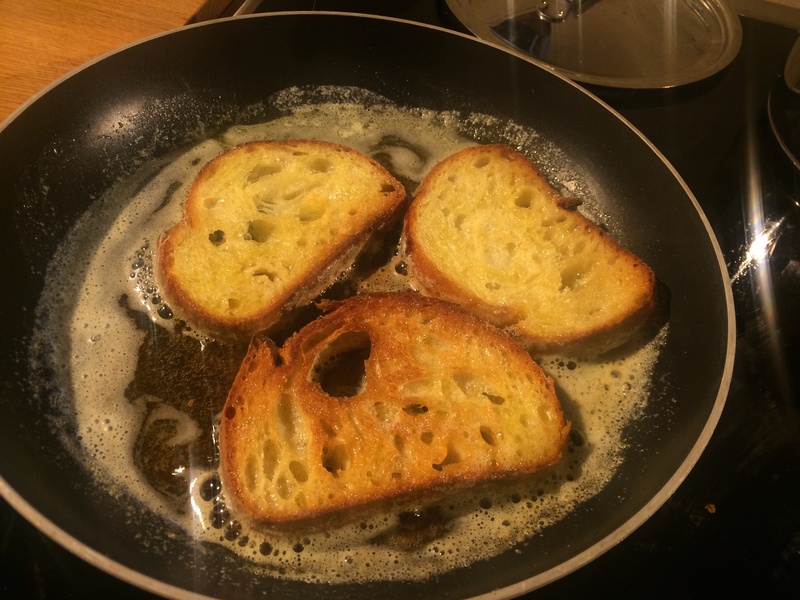 I’d bought a loaf of Gail’s sourdough to go with this, so I fried slices of that in butter. I also cooked a pack of Waitrose Toulouse sausages as an insurance policy. 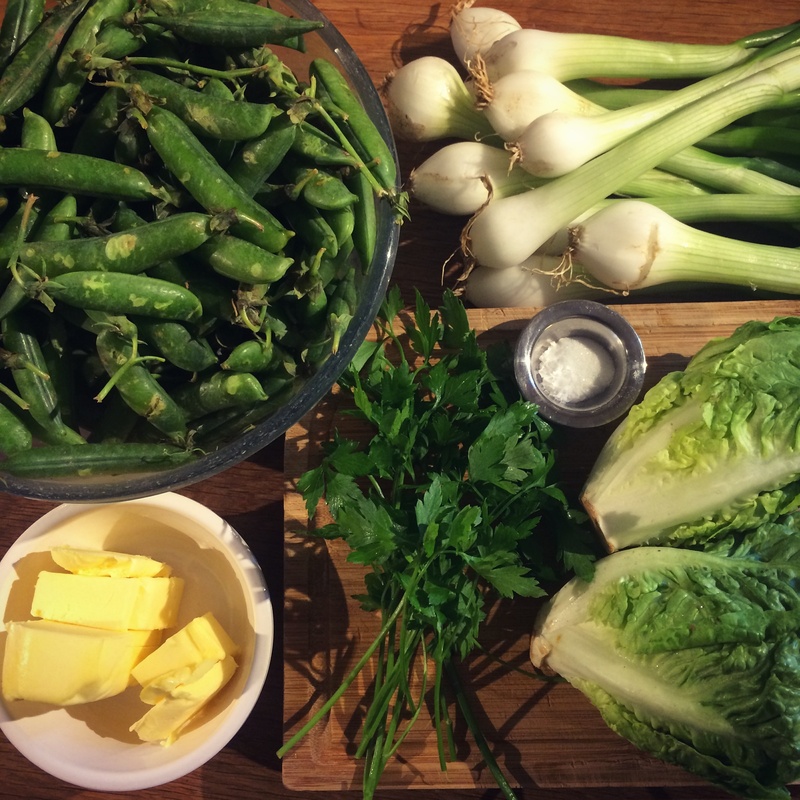 Fresh peas from the pods, cooked in a pan with very little water, some large salad onions and 2 Little Gem lettuce! That didn’t sound like it was going to be up to much. I have a dread of cooked lettuce after a different experiment many years ago. Dave decided to cook sausages to go with this meal, because a bowl of peas didn’t really sound like dinner. However, the sausages were superfluous, completely unnecessary, and will now ensure meals for tomorrow lunch or breakfast. 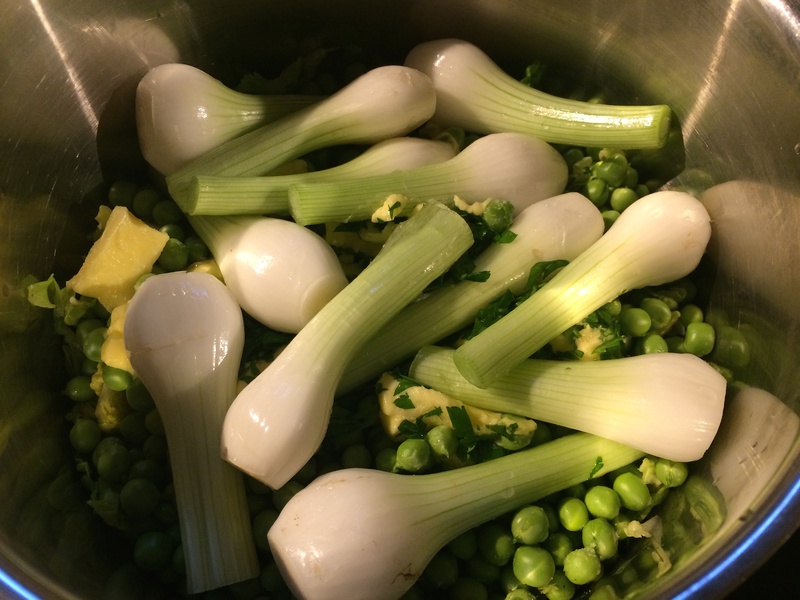 The recipe suggested serving the peas and veg in a bowl with slices of fried bread. 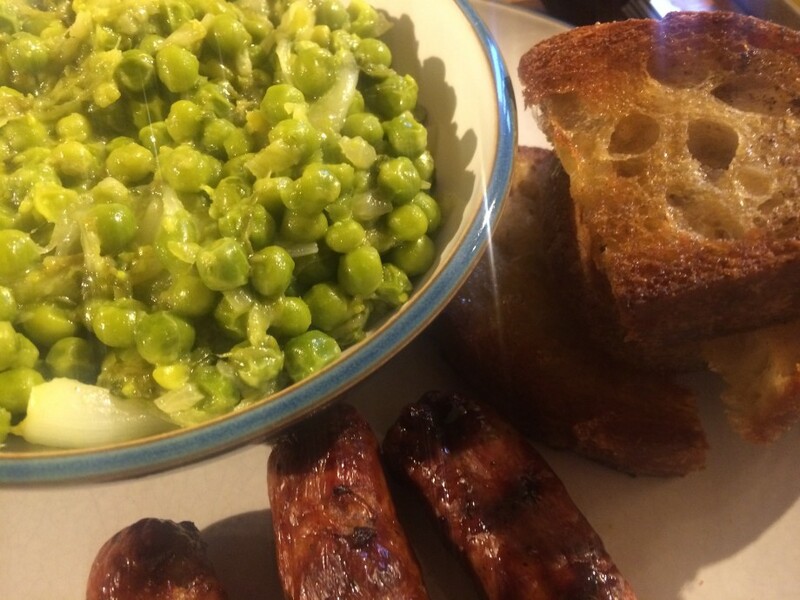 So Dave used sourdough bread, fried it in butter and served it alongside the bowl of peas. They went together SO well. The soft, buttery peas were sweet and the crunchy, chewy bread was salty. It was a delightful combination. I’d definitely eat this again. It feels very much like a winter warming supper dish, perhaps eaten steaming hot from a pot wrapped in paper on the streets of Paris in the snow. I’m aware I keep giving Dave top marks, but that is really because I can do no other. He’s not cooked a bad meal yet and the only dishes I’ve marked down have been for slight variations on appearance. This one gets 9/10. He’s dropped a mark for scaring me with the thought of cooked lettuce.